click: Place 1 advancement token on a card. You cannot score that card until your next turn begins. Can PAD Factory place tokens on non-installed cards? No. The Corp cannot choose a card that is not installed to place the advancement token on. 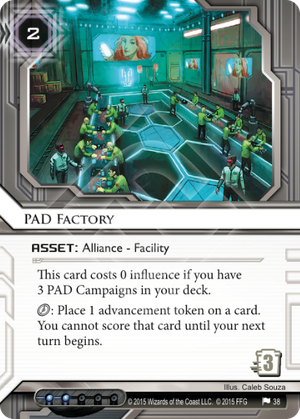 This card didn't really make a splash in the Mumbad Cycle, and that's likely to continue into the future, but in a more casual environment, you might consider including it in Weyland Consortium: Builder of Nations. You will probably, at some point, have to include non-advanceable ice in your deck - PAD Factory ensures that even those ice can maintain Builder of Nations' meat damage ping threat. Advancing cards is expensive, time consuming work. PAD Factory lets you ignore the expensive part (but not the time consuming part) by letting you put advancement tokens on cards for free. If your deck is interested in advancing a lot of cards (or one card a lot of times), PAD Factory can save you money. I don't think this is really enough justification to play PAD Factory on its own. PAD Factory is two to rez, so it doesn't actually start making you money until you click it a few times. That's not terrible, but you could probably make more money if you had just played something like a Marilyn Campaign instead. PAD Factory doesn't care about whether cards give you permission to advance them. You can advance a Tollbooth. You can advance Beth Kilrain-Chang. You can even advance PAD Factory. Functionally, this means two things. One, PAD Factory can enable Trick of Light plays in situations you might be having trouble finding cards to advance. Two, you can set up a really bonkers Mass Commercialization. Advance your cards. Advance the runner's cards. Advance everything. When you finally play Mass Commercialization, you might be gaining 10 or 20 credits. And each subsequent Mass Commercialization gives you that same benefit without the additional upkeep. Taking off a bunch of turns to sprinkle do nothing advancement tokens on runner cards is a pretty good way to get out-tempo'd and lose a game of Netrunner. If taking off those turns lets you set yourself up economically for the rest of the game, it may be justifiable. It's certainly fun to click for 20 . Play Beale or No Beale. Put a Snare! in a scoring remote and pretend it is the winning agenda. Feel wistful that Edge of World rotated. Advance a card the runner is assuming is a trap and remind them that, yes, you probably would have just scored it if it was an agenda, but because you advanced it with PAD Factory, it could still be an agenda, you see. Better check it? When they remind you you could have just advanced the card normally and scored it if you wanted to so they aren't falling for your trap, grumble and advance their Beth some more. Sparing two influence for PAD Factory is a really hard sell when you probably want to spend a lot of your influence on Weyland advanceable ICE. Tennin is pretty unenthused about PAD Campaign, as they generally don't want a bunch of undefended remotes to give the runner the option to blank the Tennin ability for a turn, and they certainly don't want to waste a bunch of ice protecting PAD Campaigns. Including 3 cards you don't want in your deck just to satisfy the alliance requirement for PAD Factory is similarly unexciting. If you come up with a solid PAD Factory Tennin deck, hit me up because that sounds incredible. Compare the text here to, say, Builder, Shipment from Kaguya , Shipment from SanSan, and Trick of Light . Or perhaps Hollywood Renovation, or Firmware Updates. Unlike every other card that places advancement tokens for you, this one does NOT specify "...that can be advanced" on your advancement tokens that can be placed. This implies you can put advancement tokens on things that normally can't be advanced. Meaning you can bait traps by "advancing" something that isn't an agenda or trap that depends on advancement tokens. Or, perhaps, put tokens on a Woodcutter while it is face down and rez it with tokens already in place. Barring an explicit ruling that that was an oversight in the card text and it works differently than that, I can see a real astonishing amount of fun coming out of this in silly ways.